Wireless alarm starter kit with Central Unit, 1 motion detector, 1 door sensor, two remotes exclusive metal. Can be controlled via the app available for both iPhone and Andriod. At burglary alarm rings up (or send SMS) to up to 5 of your pre-programmed numbers via mobile network. Well designed wireless alarm starter kit for the mobile network via built-in GSM module. When the alarm is active, it will send SMS to pre-programmed phone numbers. The alarm can also call these numbers on activated alarm and leave a voice messege. You as the owner can also call up the alarm's own number to Warn, Disarm, Arm, Triggering the alarm ( Alarm function ) and/or listening inside the house if you suspect that something is going to happen or has happened. Obviously you need the password to be able to call the alarm and operate the same. NO FIXED COSTS, Since you have full control of the alarm , and self are called when larm goes off, there are no fixed costs associated with this alarm, except for the small cost that since you have to have an active prepaid mobile phone "cashcard" in the alarm central unit. (about 1-10 € / year for to keep the card active). Naturally , it can cost some money if the alarm goes off often, but these costs are then completely tied to the prepaid mobile phone card of your choice, in the normal case, the costs are minimal. Perfect for mounting in Villa, House, Garage, Storage, Store, Warehouse and similar places. Telephone landline is not required , just access to 230V. This is a easy install and setup alarm even for those who have not done anything like this before. Wireless range up to 80 m in open space. Walls, floors , radio transmitters (cell phones , wifi , etc.) nearby can shorten the range, but is usually no problem. Would there be problems with the range we keep a small range of wired sensors that you can select (optional) in case you are uncertain. 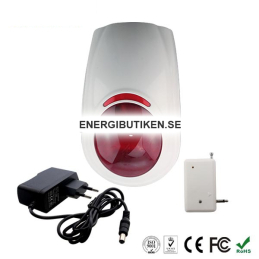 For fire alarms and IR-/PIR-detector is the 9v battery ( 6LR61 ). For magnet / window switches , vibration sensors and remote controls is the 12v battery (LR 23A ). Battery life depends on the detector and activity, but is usually around 6-24 months , we stock spare batteries at very competitive prices. The alarm handles up to 2 wired zones and 10 wireless zones, you can have several different sensors connected to a zone, so the number of detectors may be many more (just remote controls and panic buttons have unique ID). The alarm has "Intercom" (built- in microphone and speakers ) so you can dial up the alarm and talk to people who are in proximity. Programmable via the cellular network ( Password Protected ) You can change the text messages sent on alarm. 1pcs Alarm Center / Head unit with built-in battery backup. 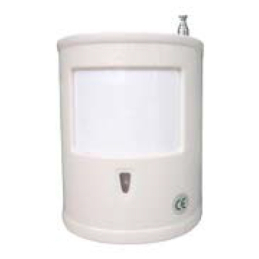 1pcs wireless motion detector / motion sensor. 1pcs AC Adaptor / Battery eliminator. 1pcs English User manual and wiring manual. 4pcs alarm decals 50 x 42 mm. 3pcs alarm decals 16 x 8 mm for mounting on detectors if you will. Batteries included with all accessories.